Lemon Blueberry Frozen Yogurt is light, refreshing, sweet and tart: a perfect pairing! For Christmas, I was given the cookbook “Jeni’s Splendid Ice Creams At Home” , and I’ve been having fun utilizing my new Cuisinart Ice Cream Maker. 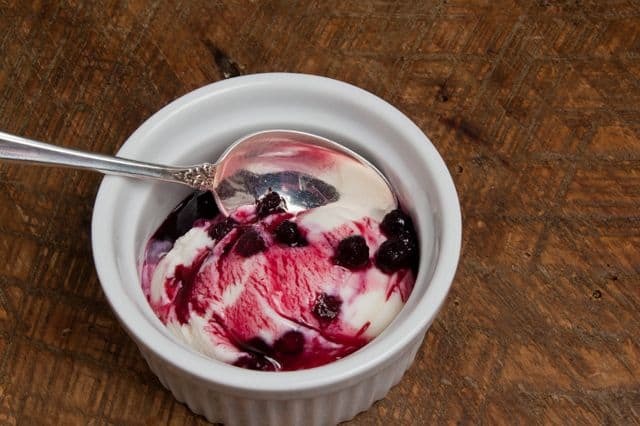 Today’s recipe is for Lemon Blueberry Frozen Yogurt, but be sure to check out the other flavors by Jeni that I’ve tried, and adapted: Homemade Heavenly Vanilla Bean Ice Cream, with my own Decadent Hot Fudge Sauce , Goat Cheese Ice Cream with Boozy Cherries and Luscious Lime Cardamom Frozen Yogurt with Brandied Cherries. Every single one of them has been amazing, and they are ALL recipes that I’d repeat again. So, even if it’s cold as Christmas when you’re reading this, let’s just say that these berries were so cold they turned blue, (Old joke from The Sound of Music) and that you’ll love it so much, you won’t care what month it is. In fact, this recipe can make ANY TIME of the year reminiscent of the warm days of good old summertime. The lemony lusciousness of this stuff reminded me of a favorite cookie that I make: my Lovely Lemon Bars. (I should post that recipe here some day, shouldn’t I?) The zest adds a powerful zing to the sweet frozen custard. And the sweetness of the blueberries? Think of them as one of the more delicious antioxidant flavor-bombs on the planet. Thank You, God, for blueberries. Another thing you’ll want to do in advance, (that I didn’t), is to make your blueberry syrup, so that it has time to chill before you use it. I made it while the frozen yogurt custard was stirring in the machine, so it was still warm, and I had to stick it in the freezer to get it to cool down, so that I could layer it in the container that I use to store the ice cream in my freezer for its final chill. And finally, you should also make your lemon syrup in advance, so that it has time to cool down as well. When you peel the zest off the lemon, make the pieces as big as you can so that they’re easy to pick out of the custard. This time, I made absolutely sure that my cream cheese was completely softened to room temperature, and well whisked, and I had no cream cheese lumps in my ice cream, so be sure that your cream cheese is perfectly softened! Lemon Blueberry Frozen Yogurt is the perfect summertime treat when blueberries are in season. Lemon Blueberry Frozen Yogurt is both light and creamy, tart and sweet. Perfectly balanced. Perfectly paired. Fit a sieve over a bowl and line it with two layers of cheesecloth (or do what I did and use a paper coffee filter). Pour the yogurt into the sieve, cover with plastic wrap, and refrigerate for 6 to 8 hours to drain. Discard the liquid, and measure out 1 1/4 c. of the drained yogurt; set aside. Using a vegetable peeler, remove the zest in large strips from 1 lemon. ; reserve for the frozen yogurt. Leave the lemon zest in large strips so it's easier to strain out later). Juice enough of the lemons to make 1/2 c. of juice. Mix the blueberries and sugar in a small saucepan and bring to a boil over medium heat. Reduce the heat and simmer, stirring occasionally, until the berries are tender and the sauce is thickened, about 8 minutes. Remove from the heat and let cool, then refrigerate until cold before using. Combine the remaining mil, the cream, sugar, corn syrup, and lemon zest in a 4 qt. saucepan, bring to a rolling boil over medium-high heat, and boil for 4 minutes. Remove from the heat and gradually whisk in the cornstarch slurry. Bring the mixture back to a boil over medium-high heat and collk, stirring with a heatproof spatula, until slightly thickened, about 1 minute. Remove from the heat. Gradually whisk the hot milk mixture intot the cream cheese until smooth. Add the reserved 1 1/4 c. yogurt and the lemon syrup, and whisk, until smooth. Pack the frozen yogurt into a storage container, about 1/3 at a time, alternating it with layers of blueberry sauce. Do not mix. End with final layer of sauce. 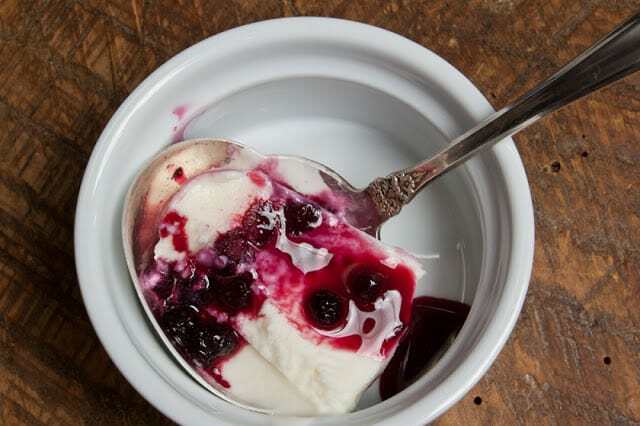 (Store any leftover blueberry sauce in your fridge, to drizzle over top of frozen yogurt). Cover frozen yogurt with parchment paper pressed directly against the surface, and seal with an airtight lid. Freeze in the coldest part of your freezer until firm, at least 4 hours. If you like this recipe, please, feel free to share it on Facebook or Twitter, or Stumble it, or use my yummy looking photos on Pinterest.